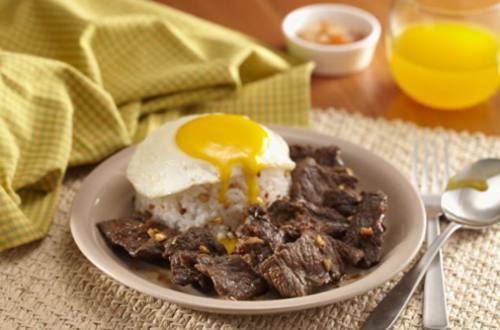 1 Make a marinade for your tapa by combining the oil, garlic, Knorr Beef Cubes, brown sugar and vinegar in a bowl. Mix this well until the ingredients are dissolved and free of lumps. Gently place the beef slices in and just leave it in the chiller to marinate overnight. 2 The following day, drain the beef and let it dry because you don’t want any of those excess liquid when you fry the tapa. 3 Fry the tapa in medium high heat with a little bit of oil. And that’s about it! Finally, this dish is done! 4 With a serving of garlic rice and egg or salted egg mixed with tomatoes and onions, you simply will want to have this any day any time of the week. Tapsilog is home!